Merry Christmas everyone! 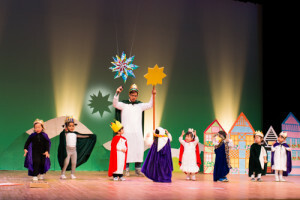 This year’s Christmas play was a first for me and it was totally amazing! All of the rehearsing and memorizing really made for a wonderful play the children and parents were really proud of! We couldn’t have done it without the hard work of the parents who made lovely props and were cheering us on from the start! Congratulations and Happy Holidays! 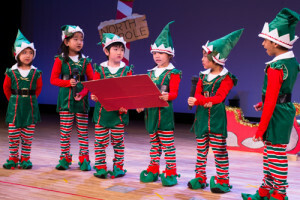 This year’s Christmas play was exciting and challenging. The students did a wonderful job of learning their lines and the movements/choreography. I was not sure if it was going to be too ambitious to have them perform a three part presentation: script, song and haka, but they are put in a terrific effort. I am very proud of them and enjoyed watching them improve with each practice. I hope everyone –moms, dads, family and friends could enjoy the entire performance, as it truly was magical. 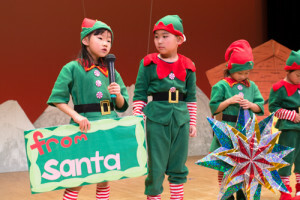 Another amazing Christmas performance from the students of English Express. Right from the day of the rehearsal I felt things were special. Everyone was happy, excited, and things went exceptionally smoothly. 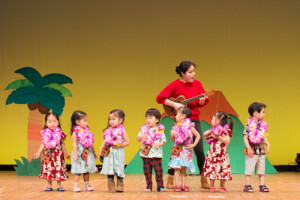 When the day of the actual performance came, I just couldn’t believe how much passion and spirit the children exhibited. It was wonderful, and certainly one of our greatest plays ever! 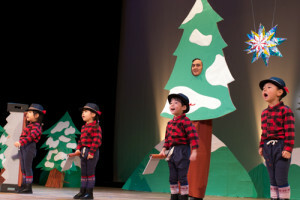 I'm so thrilled about how this year’s Christmas play turned out. 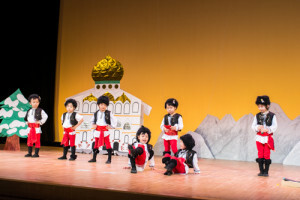 At the Onset I wasn't sure if I could turn my rambunctious group if 5 year olds into a Russian Dancing team! But with a lot of practice, joy, laughter and help from parents, we did it! Thanks. 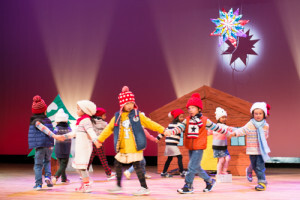 Having a chance to have a dress rehearsal in the morning before the performance let the children get comfortable in the theatre. 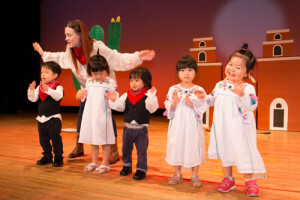 They were thrilled to see their moms and dads happy faces in the audience during the performance. The children really enjoyed watching their school friends during the rehearsal. 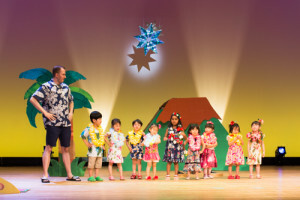 They were so excited to perform for their parents in the audience. 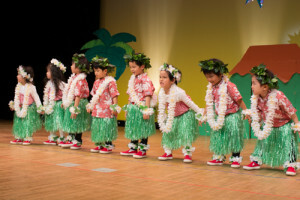 The morning rehearsal gave the kids a chance to lose their stage jitters. The performance was such a big accomplishment for them and it was lots of fun to watch. 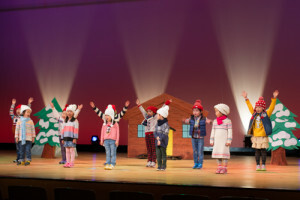 The rehearsal let the children get comfortable with being onstage. They loved being, “real”, actors with the sets and props in front of their moms and dads. Having my first Christmas play experience with this wonderful group of children was amazing! Throughout rehearsals they showed discipline, patience and great passion. Once the show was on, they shined, and their performance brought joy to everyone watching. I am so proud of my P1 kids. 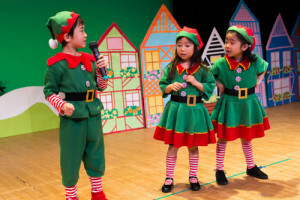 This year, the P2 class put on the best scene in the history of English Express Christmas plays. It was fun, full of energy, and hilarious. Each student made the most of their chance to shine, and all our hard work truly paid off. 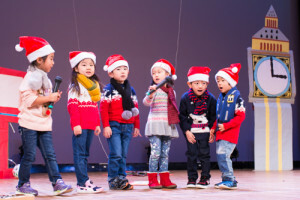 Had so much practicing and laughing with the kids for the Christmas play. They did a wonderful job and I couldn't be more pleased with their performance. Great job!! I was so proud to see how my students progressed day by day remembering their lines, and to finally see the fruits of all their hard work on the day of the performance.